The largest carrier in the U.S., Verizon Wireless, began teasing that "something is coming" on the main page of its website on Tuesday, a day before Apple is expected to announce its next-generation iPad. 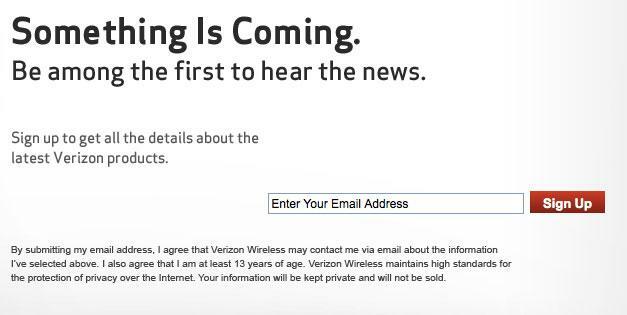 Users can "be among the first to hear the news" if they provide Verizon with their e-mail address. The carrier is hyping its unknown "something" front and center on its website, making it the first thing users see when they visit it. The advertisement appears as numerous reports have indicated that Apple plans to announce a new iPad this week with high-speed 4G long-term evolution wireless connectivity. Reports have suggested the new iPad will connect to the 4G LTE networks of both Verizon and AT&T in the U.S.
Verizon's 4G network now reaches 200 million people, making it the largest LTE network in the U.S. Its primary competition, AT&T, started building out its own LTE network later, and covered 74 million people as of the end of 2011. Verizon gained a version of Apple's iPad compatible with its wireless network beginning last year with the launch of the iPad 2. The 3G-capable model of the first-generation iPad only provided built-in support for AT&T. If the next iPad does feature a 4G radio, it would be Apple's first LTE-compatible product. Last year, Apple Chief Executive Tim Cook said poor battery life and other issues with the first generation of LTE chips were enough to dissuade the company from pursuing an LTE iPhone. But last week, analyst Shaw Wu with Sterne Agee said he has heard from sources that Apple has made "notable progress" in improving battery life with 4G LTE devices. He said Apple's work with its own semiconductors, software and batteries has given it a leg up on the competition, which is still struggling with poor LTE-related battery life. "We view the potential inclusion of 4G LTE as key with speeds approaching that of a quality personal computer experience," Wu said in a note to investors. "We also view as a positive indicator that the upcoming iPhone refresh in the fall timeframe will likely include this key feature as well."